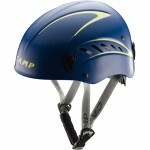 Lightweight and comfortable helmet. Certified for mountaineering, to be used where this type of protective helmet is suitable for protection from falling hazards. ABS shell with large vent holes and high-density polystyrene on the interior to absorb the energy of a falling object before it reaches the head. Turn dial adjustment, padding can be removed for washing or replacement, riveted head lamp holder clips, chin-strap can only be released with the main chin buckle.